Golden Axe is a side scrolling beat ’em up game, one of many released during the 16-bit heyday. What sets Golden Axe apart from the rest is its medievil setting with memorable characters including the legendary Gilius F’N Thunderhead, a badass dwarf with an axe to grind. There are two other characters, a barbarian musclehead with a sword, and a beefy Amazonian babe who wears a tiny bikini. Played either solo or with a friend, these warriors have eight stages to hack & slash their way through, all in the name of saving the princess and slaying the EVIL Death Adder. The game is simple enough, with the best method being to hack away and use attainable magic sparingly. Enemies are a dime a dozen as you fight through skeletons, knights and other annoyances. Every stage results in an epic boss battle, and they get increasingly more difficult as the game goes on. Occasionally enemies pop up riding on dragons and other beasts — these can be knocked off and used for your own gain. While pretty formulaic throughout, Golden Axe is very well-polished and still holds up today. There are some unique levels included, such as one that takes place on the back of a flying bird (falling off = instant death). On top of the regular game mode, there is a beginner option for those looking for a quick and easy fix, as well as a Duel mode that pits you against rounds of increasingly more difficult enemies. But really, the coup de grace is battling through the adventure with a friend. 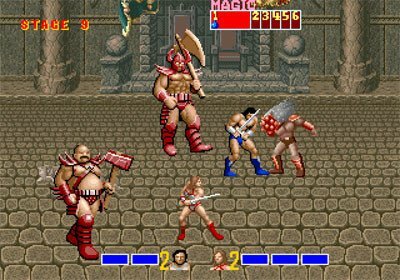 Although Golden Axe tends to show its age today, especially with its laughable sound effects, its general gameplay holds up well. This is a classic beat ’em up with a well-deserved legacy. Dude. Awesome game. One of the few I actually beat in an arcade. Totally worth the quarters. Hell yeah, man. Never played it in the arcade, but it was one of the first Genesis games I got back in the day. I love the classic Gen games! I liked all three of the Golden Axe games, a bit tough at times. I played this one recently on a Sega compilation for the PSP, and it’s still a lot of fun. Definitely dated, but it hasn’t lost the enjoyment. Absolutely. Some of the old school beat ’em ups are still a blast to play, especially the Golden Axe series. Glad you rediscovered it! A timeless classic. Used to play it in the early 90s on the arcade, have the arcade version now on my laptop, playability along with crime fighters is unrivaled for that generation.. Totally agree. All of this recent talk has made me want to fire it up again! Played this again recently only to find it had aged considerably, and extremely difficult solo to boot! This is in contrast to Streets of Rage, which is still very enjoyable. Really? I think this game has held up surprisingly well over the years, and I didn’t find the solo campaign to be too difficult. Then again, I may just have the levels memorized from playing so much back in the day. Streets of Rage is pretty awesome, though. I agree with you there! When I first got a Megadrive my buddies and I would play this constantly along with Streets of Rage. My how we picked on thos thieving gnome guys.